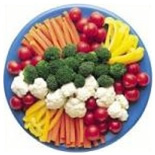 Arrange cut vegetables on a platter. In a small bowl, mix sour cream and salsa. Serve. Serving Size: 1/4 of recipe. Scrumptious! Sure to delight the senses! in plastic wrap and chill until ready to serve. the picks at a slight diagonal. 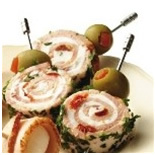 Garnish each piece with an olive. Cut each pita around the outer edges to form 4 rounds in all together. Brush each round lightly with oil. Cut into quarters. 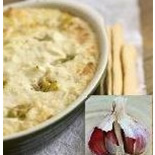 Top each quarter with 1 tablespoon of cheese. Combine cranberries, sugar and red wine vinegar in a medium saucepan. Add onion and garlic, return to a boil and reduce heat. Simmer on low for 10 minutes or until cranberries pop. Pour into a glass bowl. Stir in basil and oregano. Brush both sides with oil. Broil each side for 1 to 2 minutes or until golden brown. 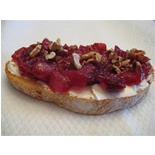 Top each slice with cranberry mixture. lemon juice and cayenne pepper, mix well. Marinate fruit for 1 hour. On a skewer, alternate fruit wedges; chill. Garnish with mint sprig, if desired. Halve artichokes lengthwise; remove center petals and fuzzy centers of artichokes. Rehydrate tomatoes in boiling water for 3 minutes until softened. Cook eggplant in simmering chicken broth for 10 minutes; drain well. Stir in chopped artichoke hearts. spoon 1 heaping teaspoon of the eggplant mixture onto wide end of artichoke leaves. Garnish with a fresh herb leaf, if desired. 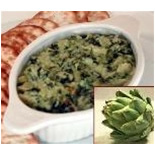 Arrange artichoke leaves on a platter, surrounding a bowl of the eggplant mixture. Use artichoke leaves to scoop up individual servings of the dip. 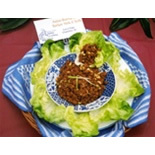 Dip can be prepared up to 24 hours ahead and chilled until serving time. artichokes; blend well. Refrigerate until serving. Serve with cooked artichokes. exchanges are calculated based on the American Diabetes Association Exchange System. to break up any clumps. Cook until lightly browned. sauces, ginger root and garlic. Cook until hot and well blended. cup and roll tightly to enclose the turkey mixture.